Therapy & Fitness Massage Massage Creams - 13-3232 - Soothing Touch Calming Cream, 62 Oz. Therapy & Fitness > Massage > Massage Creams > Soothing Touch Calming Cream, 62 Oz. 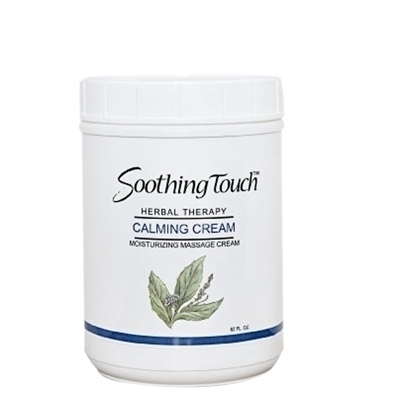 Soothing Touch Calming Cream, 62 Oz. Soothing Touch massage lotions, creams and oils. 62 ounce: Calming Cream. Melt away clients' stress by massaging with Soothing Touch Calming Cream. Infused with Kava Kava, St. John's Wort, Valerian and essential Lavender Oil, this rich cream is formulated to completely relax the mind and body. This is an ideal choice for clients whose tension is caused by stress. It has a mild and pleasing lavender scent and will leave them feeling relaxed, rejuvenated and replenished. Dimensions: 13" x 6.25" x 6.25"